BBC NEWS | Africa | How has Christianity changed? As people flock to celebrate Easter and considering the rise of the so-called super churches in Africa, has Christian faith changed? A majority of Africans put religion above any other self-defining factor in a recent BBC survey. Millions belong to Pentecostal and Evangelical movements, the fastest-growing strand in the Christian faith. These super churches emphasise faith through fever-pitch gatherings, spiritual rebirth and using the power of the Holy Spirit to transform lives. They also use broadcasting, the internet and 24-hour telephone lines.. However critics say that the movements are based on shaky theology and are used to enrich pastors through their so-called prosperity gospel which encourages followers to pay tithes they can't afford. Where do you pray? Why? What do you pray for? What do you think the role of church leaders should be? Many pastors are there to give direction and hope in people's lives. Some have left their good-paying jobs. They deserve to be blessed by God. How can one preach prosperity which he doesn't experience it themselves? Please people let those genuine pastors prosper, they have a lot to think about and to make their flocks and church better by the grace of the Almighty. Criticise the politicians who just think of themselves. "Trust in no man for he shall deceive you". My faith and the love of the Lord is within me. The role of church leaders should be more of leadership, leading the congregation by example. The current trend for churches is for miraculous wealth, healing, and the focus of attaining higher members resulting in larger than life church structures. The problem here is that, although religion promises rewards, there needs to be a balance of expectation and the ability to realize that these church leaders are accountable to God and not Gods in any right. I agree that some pastors today are out there to enrich themselves but there are some who are genuine. Yes they should preach about tithes and offerings. Through my own experience if one pays tithes and offerings one will never lack. God has promised to open the floodgates of heaven and that's what he does for those who tithe. Whilst pastors prosper so does the congregation. Problem is we don't do it so how will we ever know? Most Nigerians are now oppressed by two entities; the pastors of the churches and the corrupt officials. Both entities tell the masses that their rewards are not here on earth but in heaven. This is not good for the suffering masses. Very valid point, Roland (Liberian in the US). Whilst there is indeed a lot of scam that needs to be cleared out, we don't have to throw out the baby with the bath water. I would rather see men of God (Pastors) getting rich than people like musicians and footballers. The Pastors are used by God to give people life changing messages (whether prosperity gospel or not), hope, joy and peace. What do musicians or footballers give us? The problem with modern churches, especially in Nigeria, is that they have become business venture. Salvation is now mostly determined by the amount you able to give. If this were not to be so, with the number of churches we have in Nigeria today, the level of corruption and other social vices would have been completely reduced. It is only the almighty that can remedy the situation. Religion is the Opium of the Masses! With the average African living in a cycle of hardship from birth till death, the promise of divine redemption/elevation clearly has its appeal, hence people pray for a better life than one they currently live. Funny thing is No-one has come back to tell the tale of how good the afterlife is! As a member of the Pentecostal denomination, I am convinced that God is actively involved in the day to day happenings in my life. I pray to my God every day for his guidance and protection. It is the duty of religious leaders to guide their members to God, while church members in turn have a duty to support the church through tithes and offerings. I can vouch from my own personal experience that God unfailingly rewards such faithfulness and devotion, as promised in the Bible. Church leaders are meant to guide people through a religious life in however, as many things go out of fashion, today's church leaders, mostly in Pentecostal churches, preach for financial gain. My uncle, who is a church elder, has advised my father to do the church thing because there is money in that business. I stand by the opinion that religion has changed and become the one of the new African colonisers in a different form. Many small churches have mushroomed in Bunia, Eastern D R Congo. Here religion should play a very important role, to reconcile the people who have been involved in the interethnic clashes which claimed 50,000 dead. However, many pastors live solely on money, food stuff and other things collected from the Christians. African Pastors do not come no where near to the corruption based on "Transactional Theology" called Prosperity Gospel in churches in especially, the U.S. and the U.K. This is not to say that some African church leaders are not driven by prosperity Gospel to gain wealth too. Rather, charging them with corruption and neglecting their hard work in the communities is equally so unfair. For me, if it had not been for the church in Liberia, I am not sure where I would be by now. The African church has brought many of us closer to God and has prepared us to be respectable and decent men and women today. I do pray during my quire time at about dawn in my parlour. The reason is very simple because my scripture told me that I should go in secret and pray and God who hears me in secret will reward me openly. The role of pastors in the society is to change lives but in our society prosperity enriching pastors is the order of the day. Instead of praying and preaching the gospel they preach prosperity and the unsuspecting members donate to them without having anything in return. Nevertheless I will never leave the blame solely on them because poverty in Africa has partly contributed to this change in religion. I guess a government ruling could change religion for the better. Some church leaders of these days, are not playing the role they should play in our society but making money out of our poor and innocent people or flock. Most women are defrauded most of the time and those church leaders doing that are putting the rest in bad light. For me as I can read and pray to God I would not let pastors who make money out of their people take advantage of me. The good news of the Bible (which it is indeed) is always more welcome amongst the poor and suffering. This accounts for its popularity in Africa. Unfortunately the church like every other good thing will get infiltrated by counterfeits. Some of those pastors started out with a true calling on their lives, but have evolved into the very wolves the Bible warns us about. Their sermons are full of psychology, philosophy and low and behold; actual Biblical principles on gaining wealth. The new so-called super churches of Africa have their pros and cons. Africans have been marginalised for a very long time in various places around the world. These super churches have been able to bridge that gap for a lot of disenfranchised Africans. I believe they have helped in representing and empowering many Africans all over the world, which is positive. However, corruption is a problem everywhere, therefore African Churches are not immune to corruption. Religion is what it's always been in Africa. 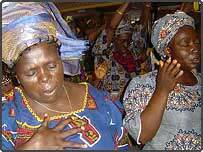 Religion in Africa is that aspect of Africans' life where they go close or feel close to God. In saying this, I must admit there are people who champion the leadership of churches purely for its financial rewards, but nowhere near what people do with churches here in the West. Here in the West, we've seen some unthinkable things done in churches and put on national television, makes you wonder sometimes what exactly religion is. But in Africa it is simply devotion and praises to God and if you're sincere about it, you might just find God right close to you. Religious leaders in many African countries have gone to another level. People are being brainwashed from birth with the wrong teachings. Mixing common sense and mythology. Blaming homeless children of being witches. Business men using the lack of education in the countries to make money by using religion. A lot of churches are led by priests with a reasonable amount of wealth, given by the followers of the church, who themselves are so ignorant. Ours is not religion but an encounter with Jesus Christ. I agree some pastors enrich themselves, however a purposed church based on God and the Bible does not make only the pastor rich but a prosperous congregation and nation. It is unfortunate that while people in other parts of the world are sanitising their adherence to established religion, Africans are getting even more attached to their religious beliefs. The more we get attached to religion, the slower we catch up with the rest of the world in socio-economic development. Therefore, my advice to my fellow Africans is to reduce our dependency on a non-visible spiritual being to help solve our problems and start tackling them head on. I worship and pray at Trinity Methodist Church as it is an Orthodox Church. The role of church leaders should be to preach the gospel and encourage the spiritual welfare of the congregation. We are said to be the most religious people in the world by embracing mainly Christianity and Islam which are the religions of love and peace. Looking at the reality of the continent, aren't we being hypocrites within ourselves? The zeal of church leaders should not emphasise on promising Africans the heaven only but also on making them peaceful and prosperous people before they get there.